Get ready to blend a variety of delicious food and tasty beverages! 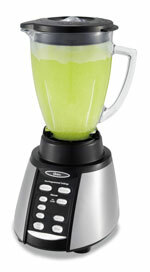 The Oster Blender is made in North America, and backed by the superior quality and power of All-Metal Drive. The two connecting pieces are made of metal rather than plastic to last longer. 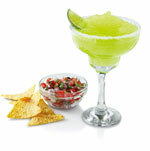 This gives you a durable blender that will serve you time and time again for all your entertaining needs. This stylish blender features a powerful 600-watt motor and a stainless steel "Ice Crusher" blade for perfectly crushed ice every time. 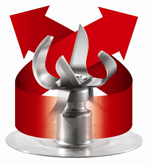 The reversing motor alternates the blades forward and backward, drawing food and ice down for consistently smooth blending. This means less time scraping food from the blender with a spatula and more time enjoying your blended creation. With seven speeds and High and Low pulse options, you will have amazingly precise control at the touch of a button. You can also choose how involved you want to be in the blending process with different settings options. The pre-programmed settings, including time and function, allow for one touch operation. There are also Low, Medium, and High manual settings for you to try. Either way, you’ll be able to perfectly blend whatever is on your menu, be it a hot bowl of soup or a frozen drink.